BT YouView adds 5.1 Dolby Digital Plus surround sound | What Hi-Fi? YouView from BT has added 5.1 Dolby Digital Plus surround sound to its BT YouView experience. It looks like the 5.1 DD Plus sound will come from HD movies on-demand, offered by BT's own content portal to BT YouView customers witthin the standard YouView platform. BT has over 6,500 programmes available on-demand with HD films joined by UK and US TV shows, kids shows with no ads, and more. 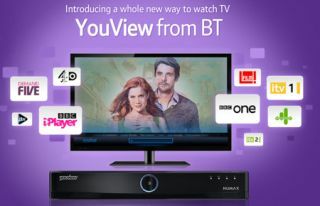 YouView is available through BT and TalkTalk as part of a subscription deal involving broadband and phone connections, or simply by buying a YouView Humax box in store, with no subscription necessary. Dolby Digital 5.1 surround sound was made available to YouView Humax retail boxes thanks to an automatic software update in January. The BT YouView box is the black Humax DTR-T1000, while the silver Humax DTR-T1010 is the box on sale in stores. We're told the two boxes are otehrwise the same but we'll be double-checking ourselves very soon. Alex Green, director TV, BT, said: “YouView from BT is one of the easiest ways to watch movies, and we’re now offering a great sound experience so customers can get the most out of their on demand programming. YouView recently revealed the service is now in 400,000 households and showed-off the new YouView Android app for controlling your set-top box.